When I head out to the woods to bowhunt, the one thing I make sure I remember is my rangefinder. If I forget my rangefinder, I immediately go back to the house to get it. Rangefinders help to eliminate improper yardage estimations and increase successful harvest rates. Accuracy in yardage estimation changes when you get up in a tree. When elevated, you see much more terrain. For most people, this often leads to an animal appearing to be farther than what it actually is. Even seasoned 3D shooters, who are experts at guessing yardages within 2 yards on flat ground, will be off 5 yards or more on average when judging yardages between 25 and 70 yards. In our opinion, you owe it to the animal to deliver an accurate and lethal shot. 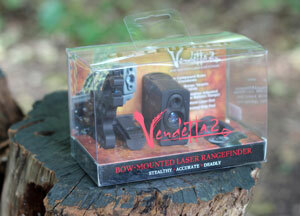 In this review we will take a look at the Leupold Vendetta 2. The Leupold Vendetta 2 is an 11 ounce bow mounted rangefinder that delivers your target’s distance with the simple press of a button. Since the Leupold Vendetta 2 mounts directly to your compound bow or crossbow, you no longer have to raise a handheld rangefinder to your eye. This drastically reduces movement and helps you stay undetected when animals approach. The Leupold Vendetta 2’s continuous scan mode will give your target animal’s range even while it’s moving for up to 40 seconds. The Leupold Vendetta 2 automatically figures out and displays the horizontal distance of your target instead of the actual distance. 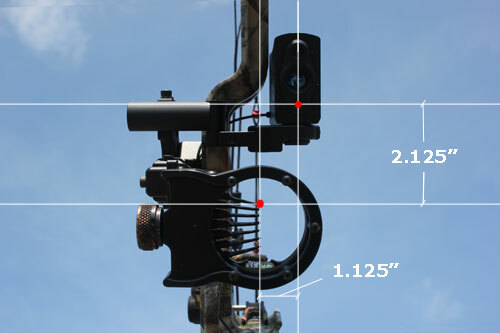 This angle compensation is extremely important when shooting uphill or downhill at a target or animal. 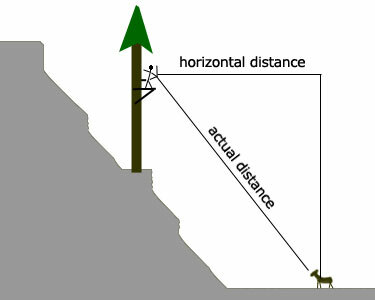 As you can see in the illustration to the right, if the archer shot the animal for the actual distance instead of the horizontal distance, he would have overshot his mark. The angle compensation delivers the yardage you need to use when selecting your pin. The Leupold Vendetta 2 can deliver a single shot yardage reading or a 40 second continuous scan reading. After you activate the Vendetta 2 with a single press of the button, press and hold the button again for 3 seconds to enter scan mode. Now, the Leupold Vendetta 2 will deliver continuous readings of whatever your 20 yard pin is on for 40 seconds. 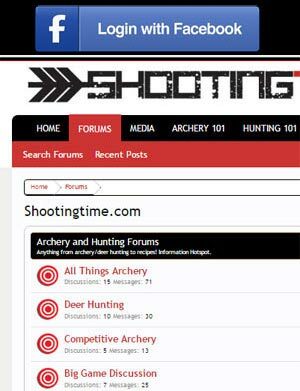 With scan mode, you no longer have to anticipate and range where an animal might cross your shooting lane! The Leupold Vendetta 2 features a laser dot alignment system that ensures it’s directly inline with your 20 yard pin. With the laser dot alignment system, you can be sure that your Leupold Vendetta 2 will be dialed in for precise yardage reading. Connect and tighten the mounting plate to the “L” shaped (horizontal) bracket. Attach the Leupold Vendetta 2 to your bow as far forward as possible. 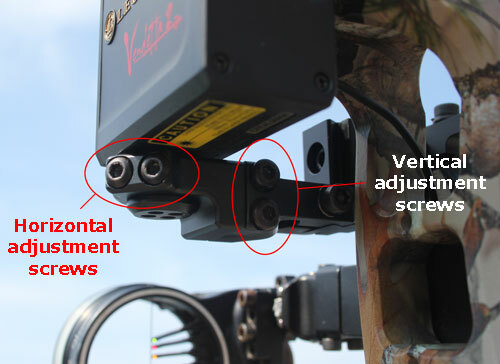 Adjust the horizontal and vertical position of the Vendetta 2 so that it is as inline with your pins as possible. 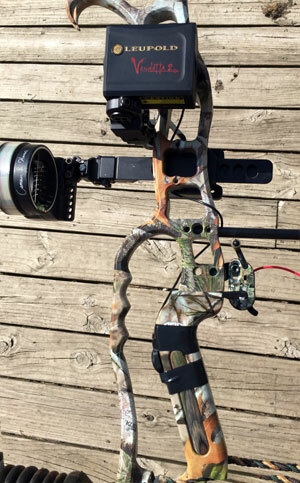 Thread the button and wire through your bow’s riser to eliminate slack and tape the button around your grip. Locate the button in a comfortable position so it will be easy to use. Measure the distance between the Leupold Vendetta 2’s laser and your 20 yard pin. Record these numbers and transfer them to the provided quick alignment guide. Draw a 2 inch circle around the offset laser mark on the quick alignment guide. 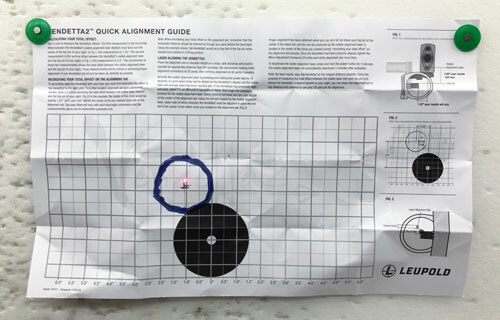 Attach the Quick Alignment Guide to a target wall at a distance of 20 yards. Depress the Leupold Vendetta 2’s button until a 10 second countdown timer cycles through for the Laser Dot Alignment system to turn on. With an arrow nocked, come to full draw and notice where the laser is in relation to your offset 2 inch circle. Adjust the horizontal and vertical adjustment screws (image below) until the laser lands in the offset 2 inch circle (above image). You are now ready to use the Leupold Vendetta 2 in the field. These adjustment screws work on a push/pull action. For instance, to rotate the rangefinder to the right, loosen the right horizontal adjustment screw and tighten/advance the left. This will “push” the Vendetta to the right via the left screw while the “backed out/pulling” right screw will allow the rotation. 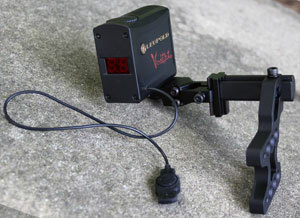 To use the Leupold Vendetta 2, power up the device by pressing the button once. Once powered up, draw your bow back and decide whether you want a single distance reading or a continuous scan reading. For a single distance reading, land your 20 yard pin on your target and press the button once. For a 40 second continuous scan reading, hold the button down for 3 seconds and release. We took to the range with the Leupold Vendetta 2 and compared the displayed yardages with the actual measured yardages. The Leupold Vendetta 2 was dead on. If you’re interested in being successful in the field, the Leupold Vendetta 2 is the rangefinder for you. 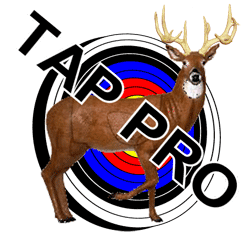 Its excellent design delivers accurate distances at full draw with the simple press of a button. No more dipping into your pocket and having to raise your rangefinder to your eye. The Vendetta 2 eliminates animal alerting movement, gives you accurate distances when it matters the most, and will skyrocket your success rates. For more information on the Vendetta 2 Rangefinder and other Leupold products, visit their website at https://leupold.com. The Leupold Vendetta 2 Rangefinder is a must have for any hunter who wants to stay undetected and deliver a lethal, accurate shot in the field.